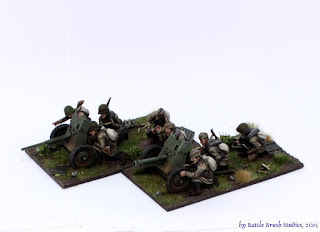 Today I would like to have a look at one of PSC's 28mm plastic kits. 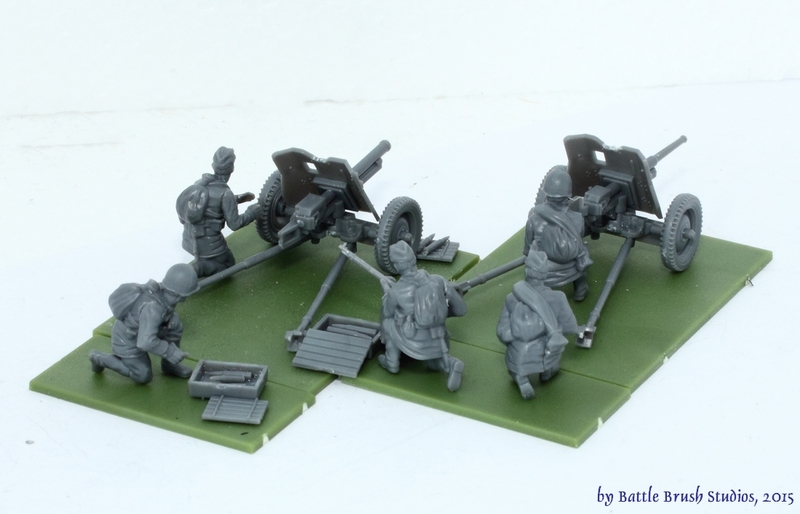 It's a quite unique set of 45mm Anti-Tank (and others) guns. 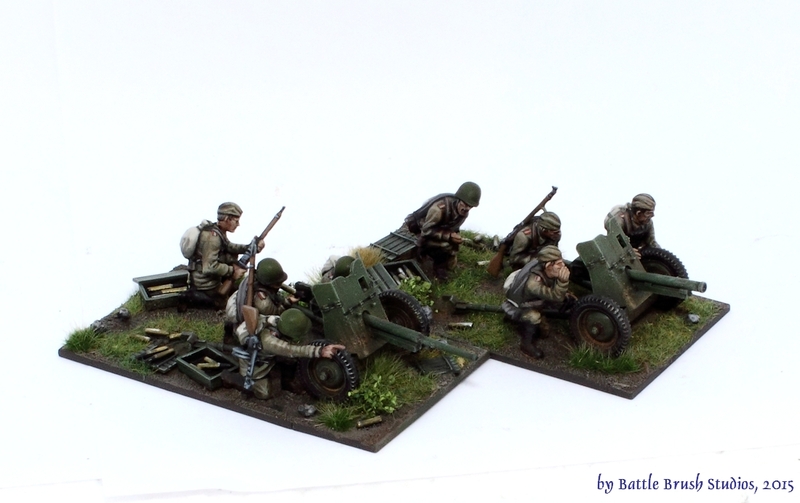 You may have noticed that I placed a certain focus on 28mm WW2 Soviet hardware again recently. At this point in time I have got the infantry, I have got the tanks, but I sorely lacked the 'king of the battlefield', some artillery. Until now. 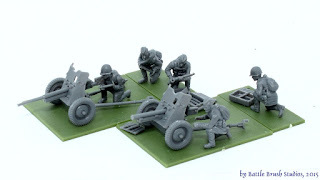 This is one of the few 28mm scale sets PSC have produced so far, and by the looks of it they certainly view 15mm (and to a lesser extent 28mm) as their core market as beasts like Warlord Games and Rubicon models tear each other apart over the 28mm WW2 market. 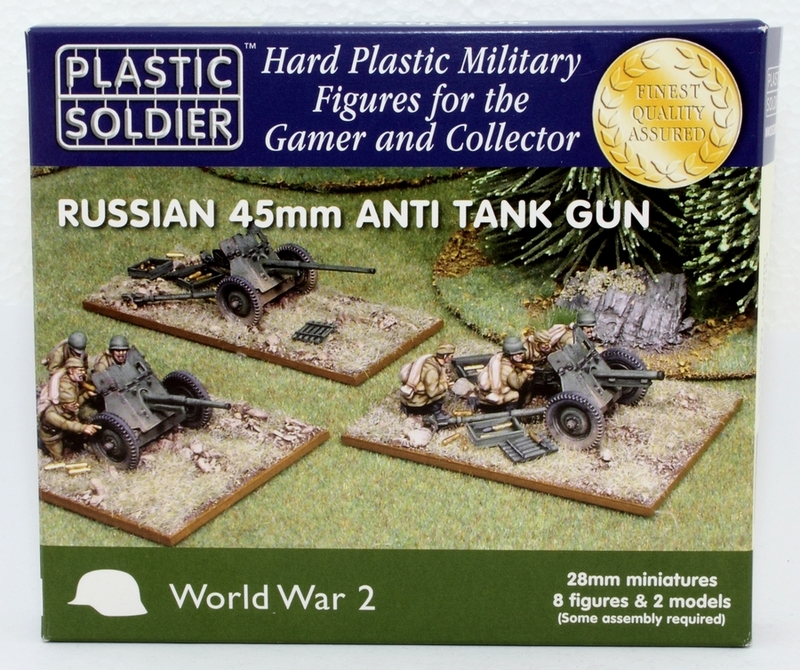 Still, PSC found their (then) niche in 28mm WW2 Soviet miniatures and released two infantry sets, a heavy weapons set and this guns set. The box contains two complete guns plus four crew figures each. 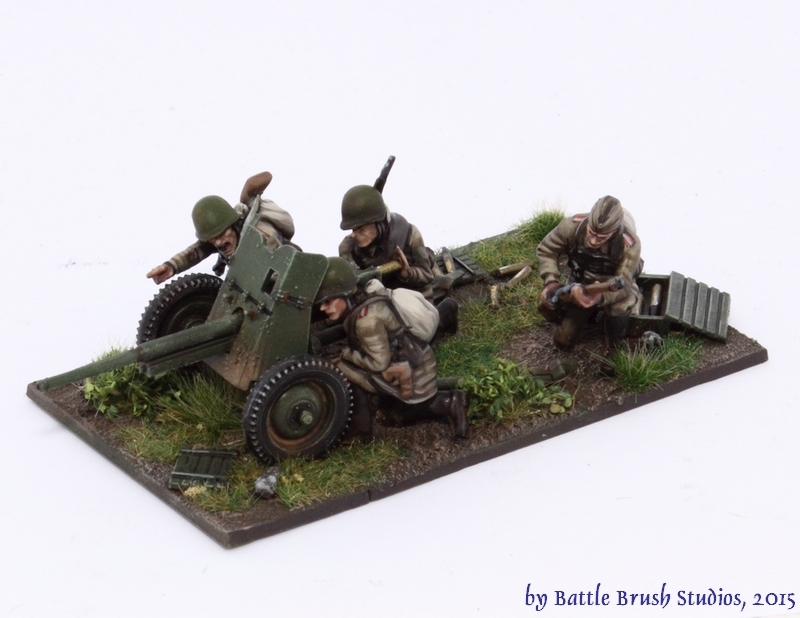 For each of the two guns you can choose to build one of three variants: The 45mm M1937 anti-tank gun, the 45mm M1942 anti-tank gun or the 76mm M1943 infantry gun. 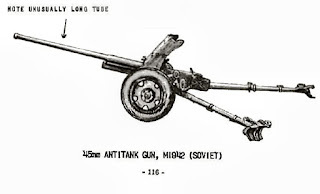 The 45mm anti-tank gun M1937 (based on developments in collaboration with German companies in the 1930s) first saw action in the Finno-Soviet war. 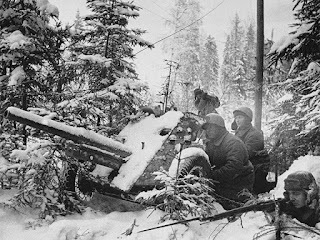 Being very effective against light Finnish armour at the time, the M1937 proved to lack the required punch against German armour when Barbarossa rolled along. Despite these shortcomings over 37,000 M1937 guns were produced until 1943. 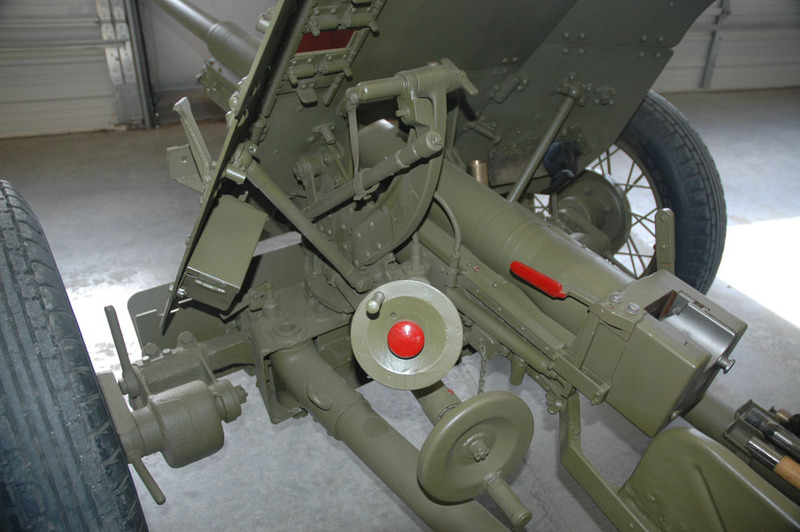 The 45mm anti-tank gun M1942 was the direct successor to the M1937. 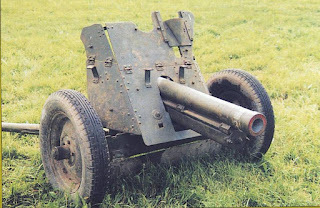 To offset the lacking armour penetration of the M1937 the M1942 was an ad-hoc development. It was basically the same gun, but with a much longer barrel. This led to slightly improved range and armour penetration, but it was just a get-by solution as by 1942 the 'tank race' was in full swing and soon the 45mm gun was as outclassed by German armour protection just like the M1937 was. The same carriage was used on this one as on the M1937 although full steel wheels were much more prevalent as opposed to on the the M1937 on which spoked wire wheels seem to have been much more used. 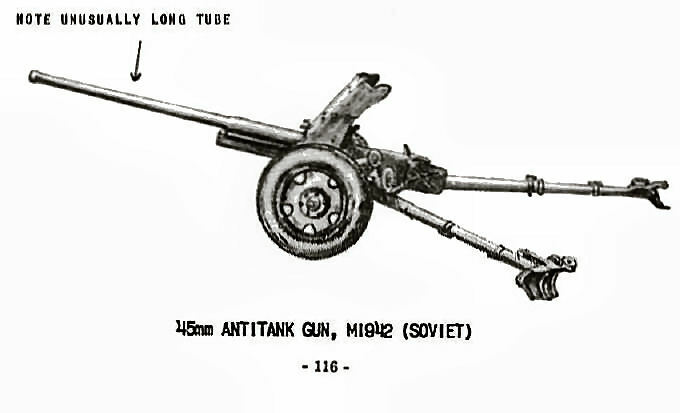 Close to 11,000 45mm anti tank gun M1942 were produced until well after the war, although they mostly were exported to allies of the Soviet union (and later saw action in Korea and the middle east). The third option out of this box is the 76.2mm infantry gun M1943, as it used the same carriage as the two anti-tank guns above. In 1943 there was a call for a new regimental gun as infantry support to replace the model 1927. 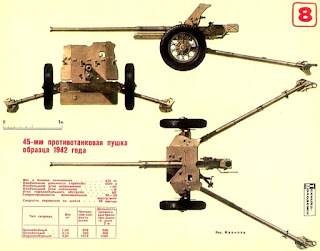 The M1943 used a modernized barrel and the M1942 carriage of the 45mm anti-tank guns. One of the particularities about Soviet field guns doctrine was that they were all designed to be able to combat infantry targets even if they are a designated anti-tank gun and vice versa. So the model 1943 infantry gun also had limited anti-tank capabilities when using HEAT rounds. Between 1943 and 1945 just over 5,000 guns were produced. 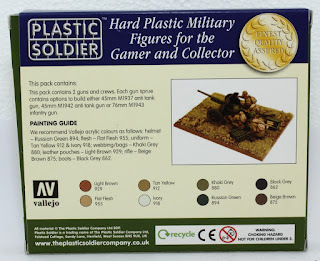 This kit was released in 2011, I think before PSC started using artwork on their boxes. Instead we get a nice photo fo three guns (two of them with crew). The colour code for 28mm seems to be dark blue with PSC. The photo could be a little misleading, as the set only contains two guns, but at least the little white text in the corner tells us so. This gold medal saying "finest quality assured" still looks weird to me. It's meant to give the rather unpretentious box a little bit of a 'classy' look I suppose. The back of the box has another (slightly less nice) picture of a built model from another angle. It gives another overview of what's included in the set and a very basic painting guide using Vallejo paints. No mentioning of the Battleground wargame back in 2011 of course. 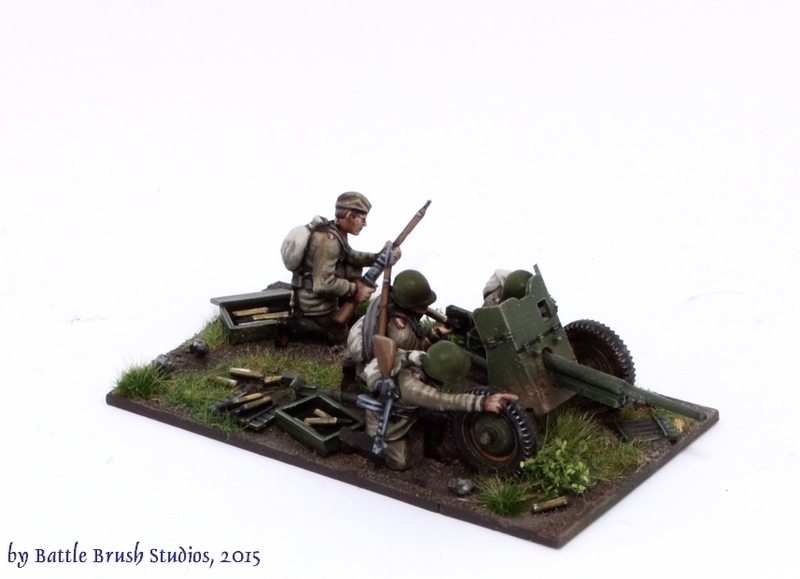 The box is in the regular PSC format, so compared to other 28mm manufacturers it's rather small. The box came without any shrink-wrap, the sprues are just lying inside. 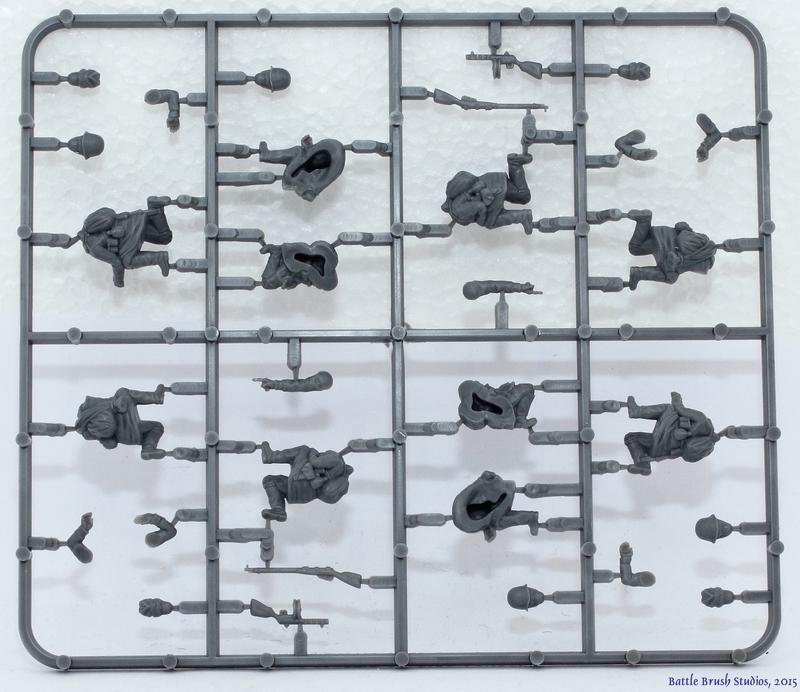 There are three sprues in each set, one crew sprue, which has eight models total. 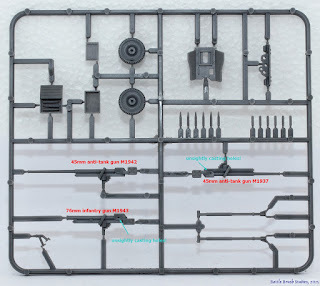 It actually is one mirrored smaller sprue, so you get each model twice, including two rifles and two PPsH sub-machine guns. The crewmen are almost one-piece, you just have to glue on some of the arms and the heads. All of the bodies are kneeling, there are just enough heads for each crewman. 50/50 helmets and pilotkas. 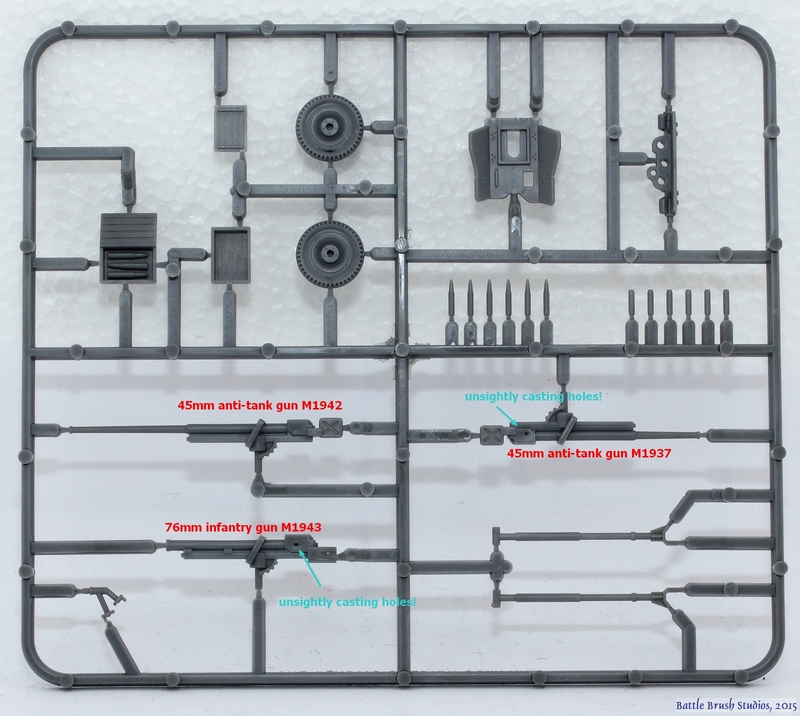 Each sprue holds a complete gun, with a choice of three barrels as well as two ammo boxes and six grenades as well as six shell cases of used rounds to scatter across the ground. There are no additional assembly instructions or anything in the box. Neither are bases. The casting quality looks to be pretty nice. Not 100% crisp and sharp in terms of detail (especially when it comes to the crewmen), but certainly usable on the table and once painted there will be hardly any noticeable difference between these and other plastic minis. The reason why the details aren't very crisp is that the models actually are up-scaled 1/72th models. The only casting problems I spotted is on the back parts of the guns, where you get the usual "holes" in the larger flat areas. No big problem, just apply putty. things are supposed to go on the model. the split pole parts are in relation to the wheels. 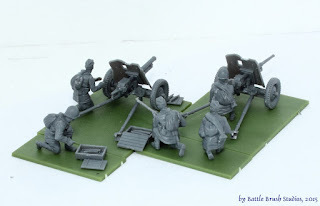 With these pictures assembly of these guns should be a lot clearer. Here we got the fellas all assembled! I only put a few crew figures on the bases for these photos because they are hell to set up without being glued on (and gluing gun crews to a multi-base prior to painting is not advised by the author!). The bases are sized 8x4.5cm from some bases sprue I had within reach at the time I had put the models together. I actually cobbled the bases together as you can see in the pictures. Not too much space on those for all the crewmen and grenades and such, but I think the size is alright, especially as setting those up in terrain will be hard enough as it is. I still need to neaten up the arm-torso connections on some of the crewmen. To get some more poses in I used leftover arms from Warlord's plastic soviet infantry and did some more conversions as well. Some of the poses (like the guy holding a shell ready for the next reload) work two times, same as the adjustment wheely things (yes, I'm sticking with the term) operator and, with a stretch the loader, because he's got a cool pose. Having one guy on each gun base pointing might look a bit daft though. 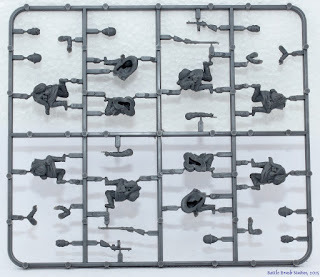 There are also some small arms on the sprues in this set. Some of them I put on the backs of the crewmen and added straps made of Green Stuff. One of the guys got a German Kar98 from some Warlord Games infantry set instead. By the way, don't forget to drill out the gun muzzles. Not a huge necessity on the 45mm guns, but the infantry gun should have a little hole for the shells to come out of I think. Here we got the two guns including crews painted and set up side by side. I painted about 99% of the crewmen and then glued them to the base. Otherwise it would have been really hard to get them painted properly. Of course for gaming purposes it's a bit inconvenient to have all the crewmen glued to the base as I won't be able to remove single casualties, but I would rather have neat scenic bases with all the ammo boxes and spent shells. I also wanted to have the crew hunkered down behind the gun shield as much as possible. I know this would be my place if I was forced to handle such an automaton in the face of the onslaught of the Wehrmacht. The basing is just a mix of various tufts and static grass. 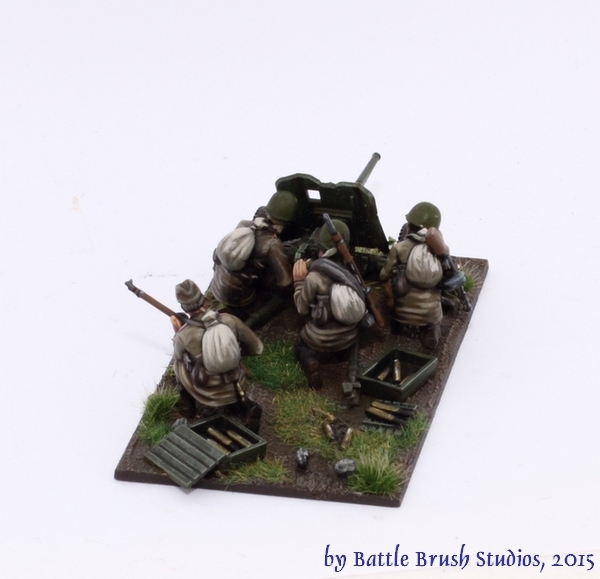 The Plastic Soldiers Company filled a then gaping hole with the release of their 28mm plastic Soviet infantry. They aren't quite as crisp as say Warlord's plastic Soviets or Wargames Factory's offerings or indeed Black Tree's, The Assault Group's or such, but in their kneeling position they work pretty well as artillery crews. On the plus side, they are well proportioned and for once at least don't come with the mix of summer and winter uniforms which seems to have been established as the standard for any Soviet WW2 infantry. These here wear regular uniforms. Scalewise the models are good, the detail seems to be correct overall. The size of the guns is correct (presuming 1/56th scale) judging from the sources I found online. 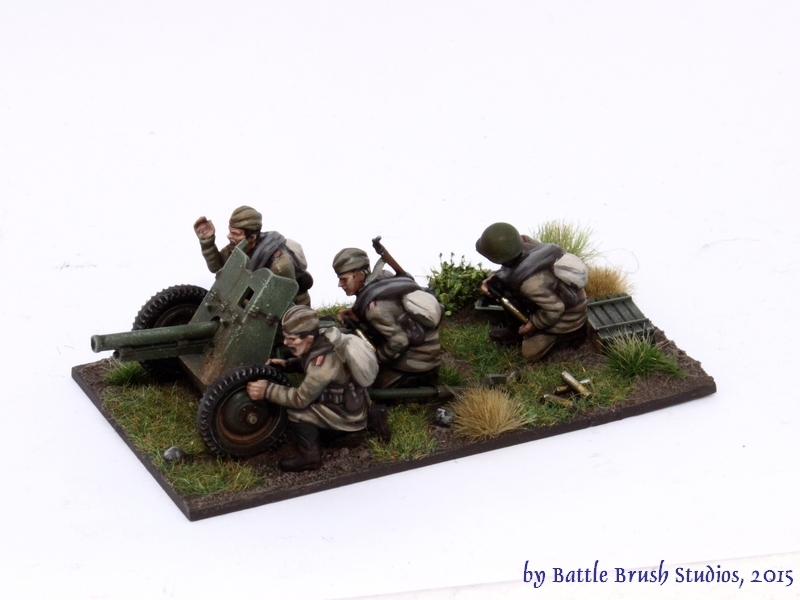 The only little thing I have to critisize is that the anti-tank gun M1937 usually had wire spoked wheels rather than the solid steel ones. That was much less common, but of course the aim of this set was getting a few variants into the same box. This set is a very welcome addition to the range of available WW2 guns for your Soviets. 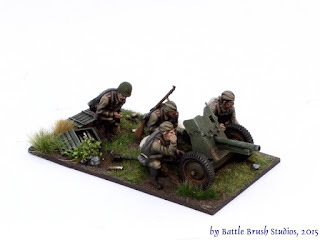 They probably aren't the most popular choices around due to their smaller calibre (especially in terms of the anti-tank guns) and many gamers, depending on rules set, will prefer the big old Zis-2 and Zis-3 ('Ratsch-Bumm'!) for all that 'late war' stuff. But it's good to have these light guns. 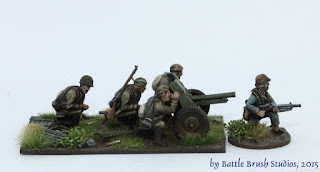 Very often they make for more interesting games, especially in 28mm scale, at which you can get only that much on the table. This kit is available directly from Plastic Soldier Company for GBP 12.50. So you basically pay the price you would usually pay for one gun and get two out of the deal. The quality of the crew casts is nothing special, but decent, the guns look great and there is a nice amount of extra stuff to put on the base. Certainly not a bad deal, certainly worth a buy if you need some lighter guns. I hope that you enjoyed this review, found it interesting, entertaining and so on. If you have any questions, comments or indeed commission inquiries, feel free to let me know via the comments section, the Battle Brush Studios Facebook page or via e-mail. Any time, Patrick. :D Thanks for the comment!